The tell-it-like-it-is bleach blonde chef on the Food Network, the Guy Fieri biography reads like a chef's modern day fairy tale. Just a few years ago he competed and won the second season of "The Next Food Network Star" and today he is one of the network's top stars along with Giada de Laurnetiis. Guy fell in love with food at the age of ten when he began selling soft pretzels from a three-wheeled bicycle cart he put together with his father. He named it "The Awesome Pretzel". After selling pretzels and washing dishes in restaurants, Guy earned enough money to study abroad as an exchange student in Chantilly, France. There he learned about French gastronomy, international cuisine, and the culture of fine food. Once he came home Guy applied and was accepted to the University of Nevada Las Vegas, where he graduated with a BA in Hospitality Management. After graduation he began working at Stouffers, managing their flagship restaurant in Long Beach, California. Three years later he landed a position as District Manager of Louise's Trattoria, where he was in charge of six restaurants. Thirteen years ago, in 1996, Guy and his business partner, Steve Gruber opened an Italian restaurant in Sonoma County, California called Johnny Garlic's. Their first location opened in Santa Rosa in the fall of 1996, and they opened a second branch in Windsor, California in 1999. Most recently, the duo opened a third outpost in Roseville.The pair also developed another restaurant concept called Tex Wasabi's, a Southern BBQ and California Sushi joint in 2003. Their first location in Santa Rosa was such as success that they opened another in Sacramento in 2007. Despite all of his restaurant successes, Guy Fieri was slated for even bigger and better things. In 2006 he submitted a tape to be on "The Next Food Network Star". Although his audition tape was submitted at the last minute, Guy was chosen to be one of the eight finalists. After several weeks of battle in the kitchens, he ultimately won the challenge and became one of the Food Network's most beloved chefs. Guy recently released his first book, which is based on his popular show. 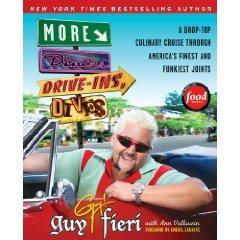 "Diners, Drive-ins and Dives: An All-American Road Trip...with Recipes!" was published by William Horrow in October 2008. The book provides recipes and memorable stories from many of the establishments that the Food Network chef has visited throughout the United States. Guy also has a weekly syndicated radio show, "Food Guy & Marcy", which he co-hosts with Marcy Smothers. He has also been a three-term President of the Restaurant Association of the Redwood Empires. He serves on the Board of Directors for the Educational Foundation of the California Restaurant Association, and most recently was Grand Marshall for NASCAR in Sonoma, California. Today Guy lives in Northern California with his two boys, Hunter and Ryder, and his wife Lori. When not on the road, or in the studio, he spends his time with his family, cooking and restoring classic race cars and dirt bikes.